Yes this is the one, the dessert I made off of a pinterest pin that I saw a few times. The pin from pinterest was just elegant and it really looked quite simple to prepare. I have been thinking for a while that this would be a pleasant dessert to have on Thanksgiving. You know to go along with all the made from scratch pies and cakes! But there is no way that I am going to make this not knowing how it is going to turn out, so I decided to try it on my family, who love me to experiment on them with new recipes but particularly desserts! I tried to follow the directions but they were so vague and it was not coming together so I had to make some adjustments and I will go through what I did and not what the pin explained. This was an elegant dessert and it tasted so good. The pear was nice and soft, the vanilla cream was so creamy and there was nothing left! 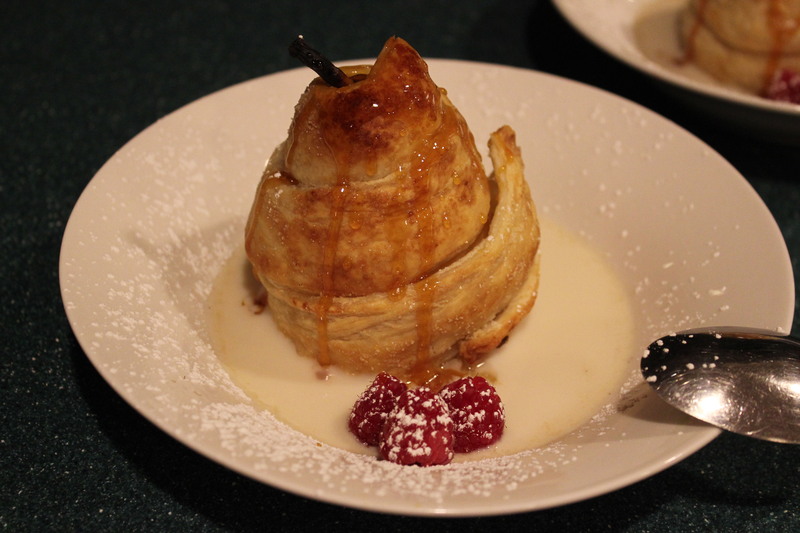 I am going to try the same recipe tonight with apples and caramel. 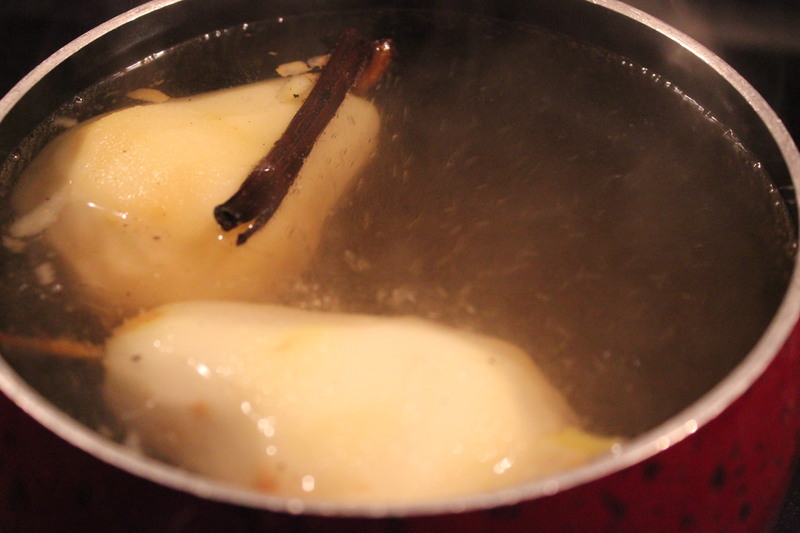 It invokes some nice autumn flavors and, the house smells really good when the pears are cooking! 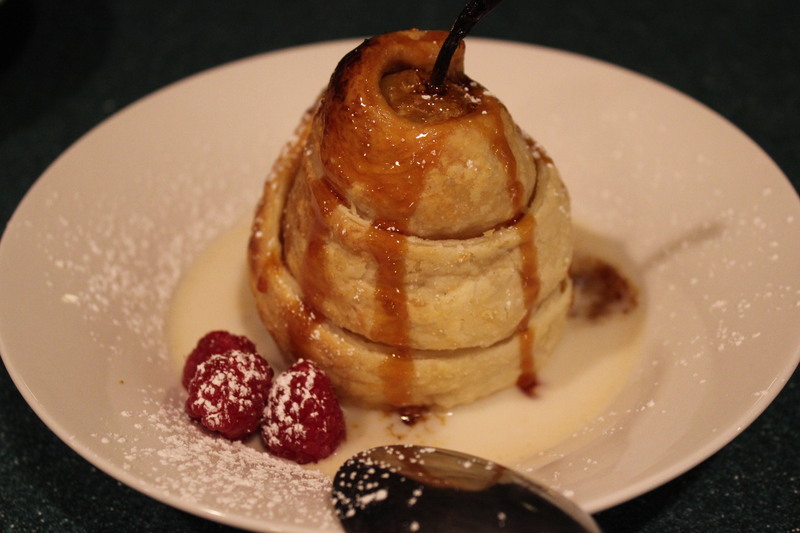 I am really pleased that I tried this and I am going to wow people with this dessert in the future! You will need a small sauce pan 2 quart, and I found that I had to cook 2 pears at a time. HINT: start this before you start your meal, it can easily be made and served fresh and hot when your meal is finished and you are ready, it is a two part dessert, because you have to cool the pears after cooking them the first time. Heat the water in the sauce pan, along with 1 cup of sugar the vanilla bean or extract (I used a bit of extract and a vanilla bean) heat until the sugar is dissolved and the water is at a boiling simmer. Bring the water to a boil turn down until it is still rolling but not boiling. 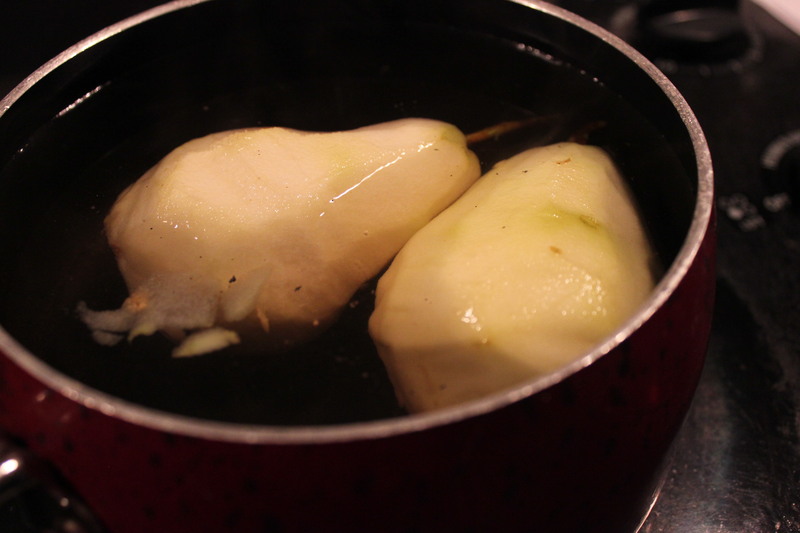 Add the pears (I added two at a time) cook them for ten minutes each. I set a timer and watched them roll, if they stopped rolling I used a wooden spoon to keep them moving to make sure they cooked evenly. Do the same for the next set of pears. 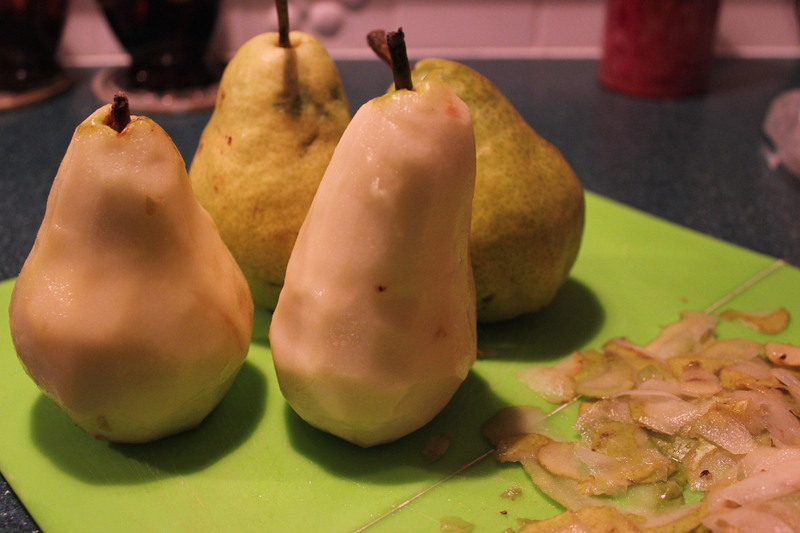 Remove the pears, cover, refrigerate for an hour or until cool enough to handle. 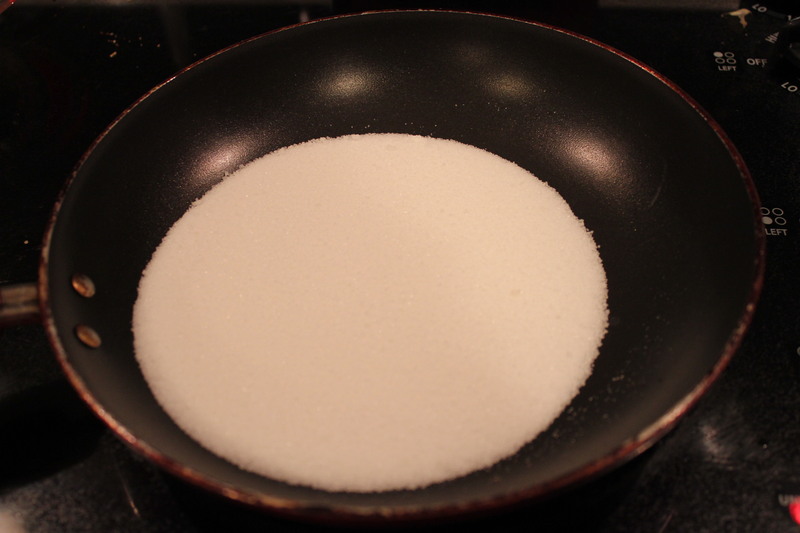 Leave the sugar in the sauce pan; this will be our base of our vanilla sauce. 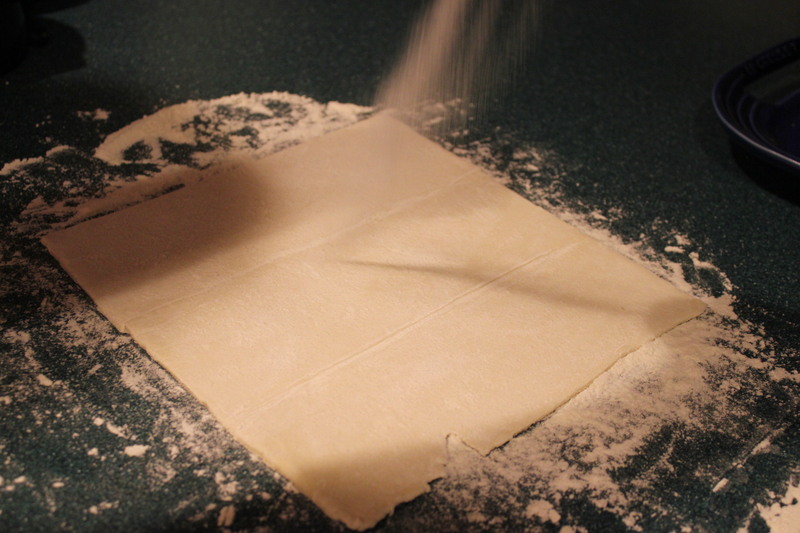 You will need 20 to 30 minutes to thaw your pastry so make sure to take it out before you start the next part of the recipe. 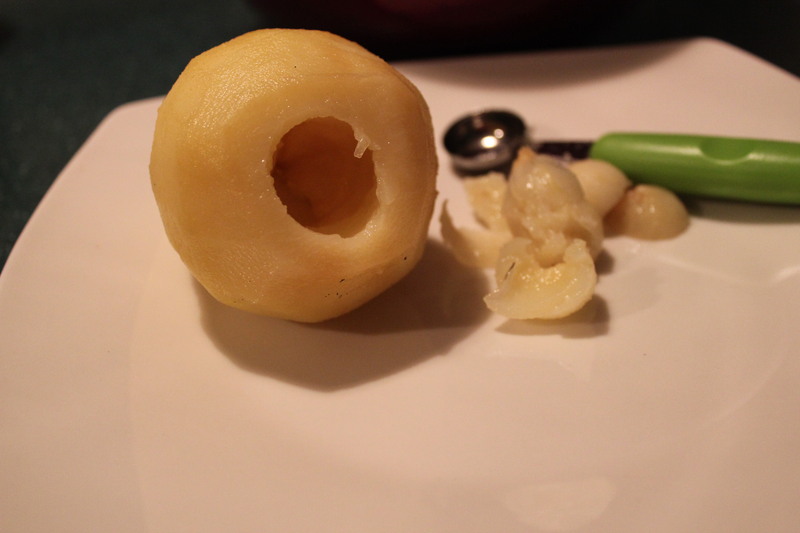 Once the pears are cool enough, use a melon baller and core out the seed from the bottom of the pear. 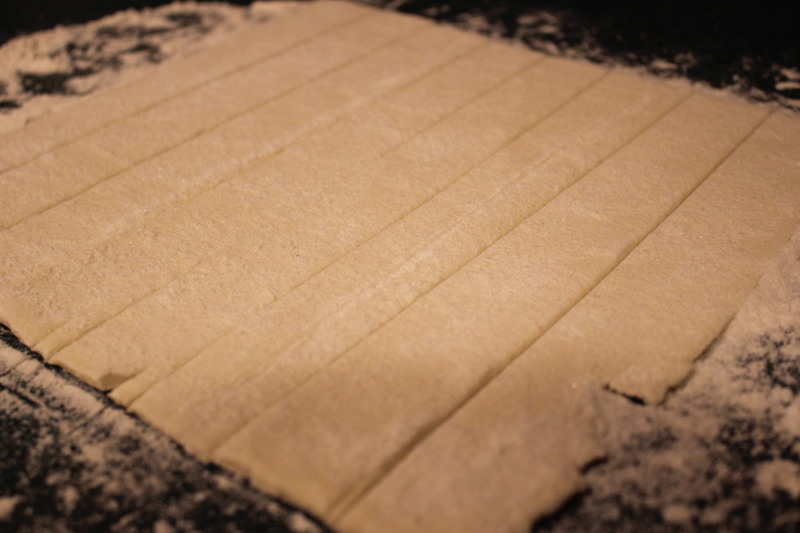 Unfold the pastry onto a lightly floured surface, Cut the pastry sheet crosswise into 8 (3/4 inch wide) strips. Brush the strips with a little bit of water and sprinkle with sugar. 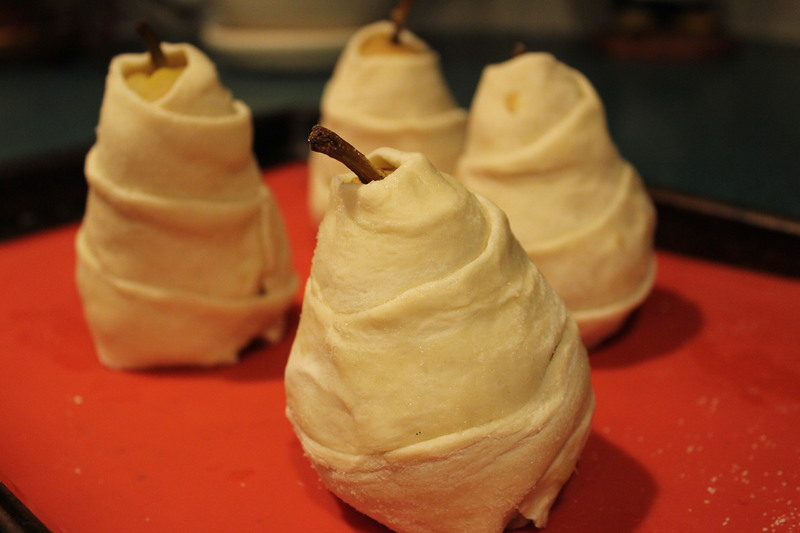 Repeat with remaining pears, cook in a preheated oven for 25 minutes. Depending on your oven you may have to cook a bit longer. 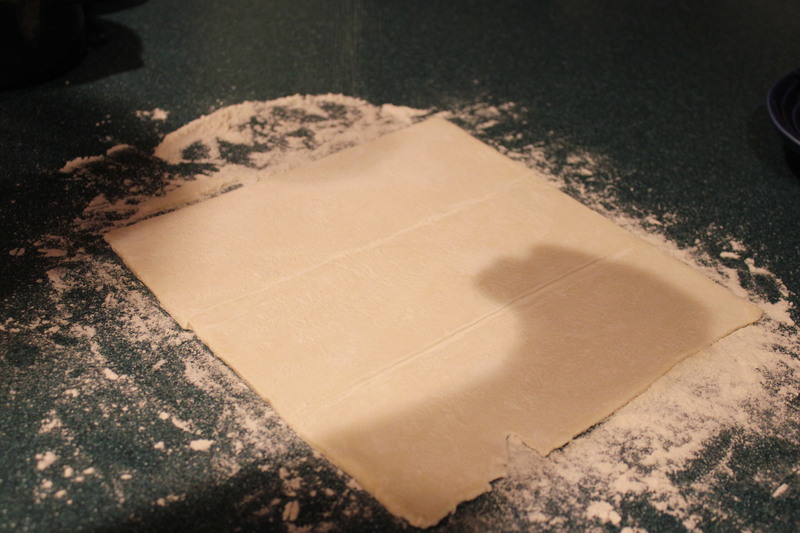 You want the pastry to be browned nicely. I cooked for 25 minutes shut the oven off and let it stay in there to continue to cook and allow them to stay warm until I wanted to plate them. 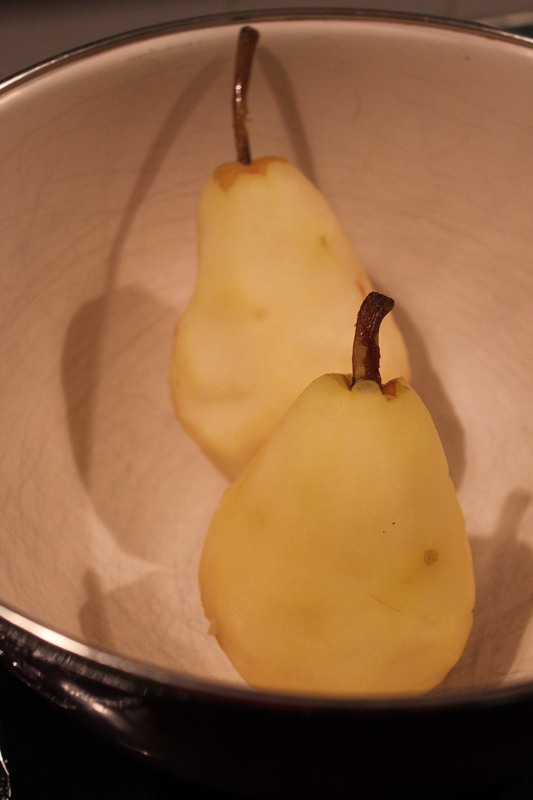 While the pears are cooking, start the vanilla sauce and the caramel. Heat the sugar water back up with medium low heat, add the cream and stir, continue cooking for about 20 minutes or until the sauce reduces to about 1 ½ cups. 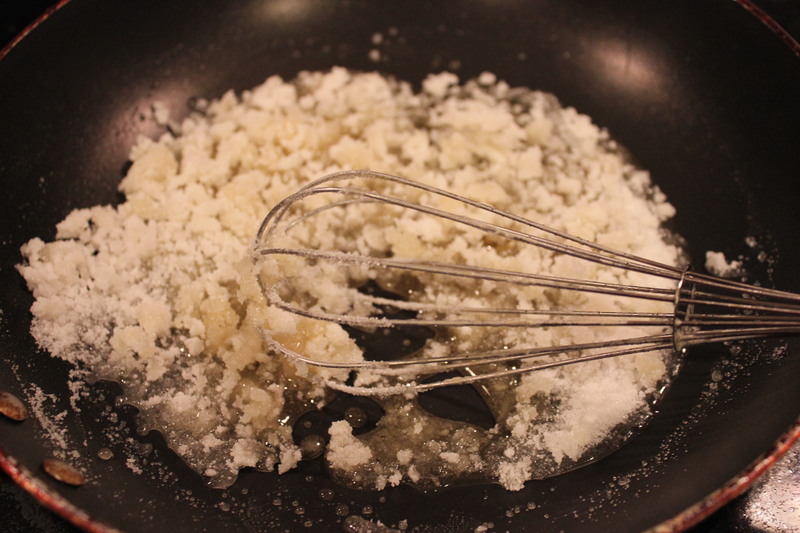 Remove the vanilla bean; scrap the seeds into the pan. Remove the sauce from the heat. In a pan put your ¼ cup of sugar, have your butter ready, over med high heat, watch the sugar, once it starts to melt stir and add the butter. 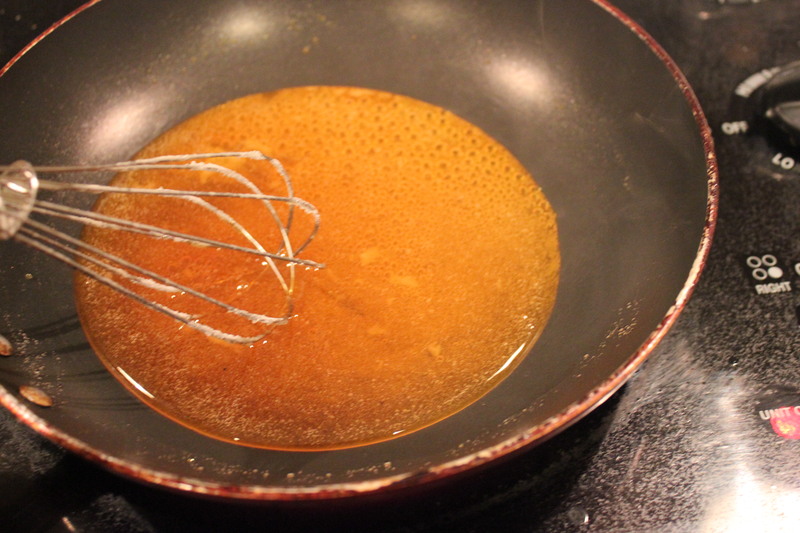 The butter is needed to stop the caramel from seizing up and turning solid. You want a creamy caramel not a tooth breaking piece of glass. 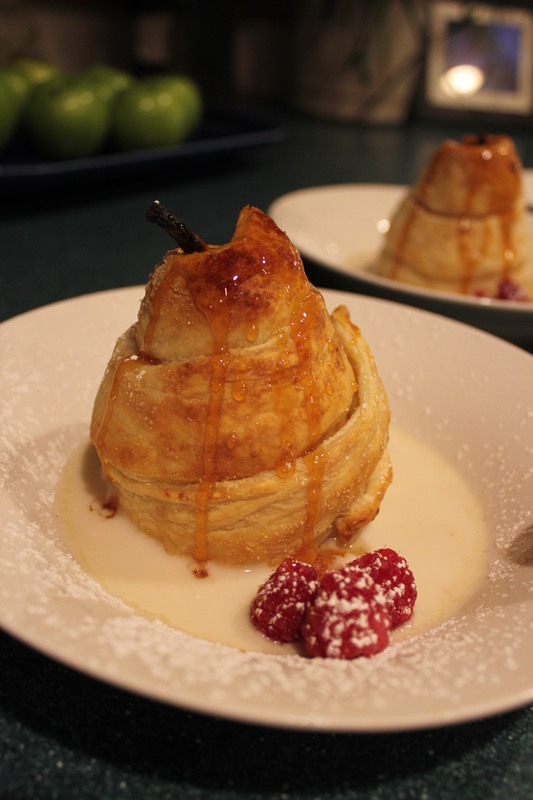 Put some vanilla sauce in a shallow bowl, place the pear in the center, drizzle with the caramel, add some raspberries and sprinkle some powdered sugar over the plate. How great does that look? And it tasted just as wonderful! Stephan loved it and I was really amazed at the wonderful flavors. This is a restaurant quality dessert! Now to try it with apples tonight! What a great dessert that I will definitely make soon. Thank you for the link to my blog. Your welcome and thank you for commenting! This one I pinned. 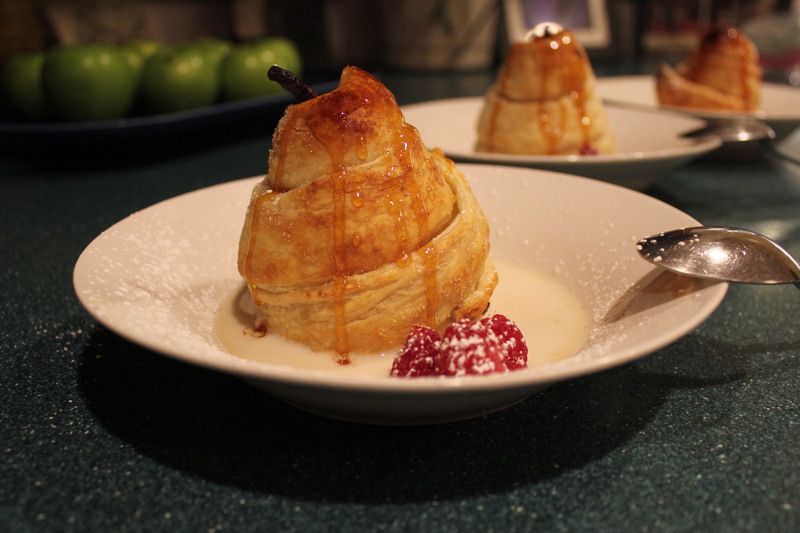 I love poached pears and the addition of puff pastry makes this sound absolutely yummy. That’s so funny, because I got the recipe from a pin! Are you following me on pinterest? if not let me know yours I will follow you! thank you for pinning it! I am Lulu Designs. And you? LauraLovingLife, I found and followed you!